We&apos;ve got two ways to experience the on-course action like a VIP - so if you&apos;ve ever even dusted off a driver, you&apos;ll want to take advantage of these offers. If you&apos;re an out-of-towner, or even if you live in the region but want to stay close to the action, there is a great travel package that&apos;s bookable through AAA (even non-AAA members can purchase.) 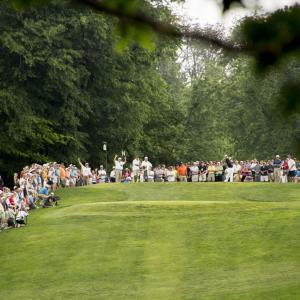 The package provides a great value on tickets to the tournament, parking, shuttle service to the course, breakfasts and lots of other tournament goodies. You can chose to stay for one night or two, and rates start at $276 per person, based on double occupancy. Book here. 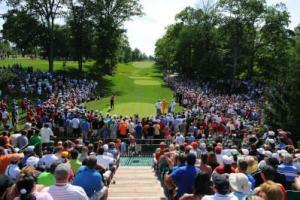 Experience Columbus also offers on-course hospitality for tournament-goers. Whether you&apos;re a local looking for a place for R&R while out at the tournament or a visitor trying to add another layer of luxury on your visit, this is a great option. 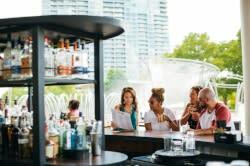 The Experience Columbus house offers unlimited food and drink, (yes, beer, wine and liquor, too,) and excellent catered dining with daily local treatws. The house is positioned with a great view directly overlooking the third fairway and hole, with a private gate cut, allowing quick and easy access for our guests onto the course. Private shuttles run all day, bringing guests directly to the Experience Columbus house so you don’t have to worry about parking near the course. The house is open during tournament play, Thursday, June 2-Sunday, June 5. Daily hospitality passes for the house cost $90, and if you buy early, you can also add a day-pass to walk the course for an additional $70. Admission to the hospitality house does not otherwise grant you permission to be on the golf course. Click here for more details.